A strong sense of who I am. Gone are the days of wondering what I will be when I grow up. Gone are the worries of wondering what life will bring. To paraphrase a favorite hymn: Grace has brought me thus far and Grace will bring me home. If I can survive what I have so far, I’ll probable manage the rest. Not necessarily easily but I’ll manage. A change of focus. Less concerned about leaving my mark on the world, I am now pondering the mark the world has made on me. What will I keep as I move on and what will I release. Getting rid of clutter, both spiritual/emotional/mental clutter and physical. Stripping down to what I really need so that there is plenty of space for what I want, whatever that turns out to be from day to day. More time. With the gotta-gottas gone, there is more time to savor the really beautiful details of the now. The colors, the flavors, the sounds. A cardinal pair. Dark chocolate. A hug. A return to old passions. With time now, I can do the things I’ve always wished I had time to do. Books. Try recipes. Books. New and old knitting patterns. Books. Not new activities but a fresh look at the them and time to try new ways of doing them and or just doing them more. A deeper sense of friendship. From a song I learned in Girl Scouts, “Make new friends but keep the old, one is silver and the other gold.” My greatest wealth is my friends, including these who are my family both by marriage and by birth. Knowing I have a support system empowers me to grow, to learn, to be more me. A better understanding of my body and how it works. Any why it doesn’t work when I ignore the signals. Contentment with my accomplishments and forgiveness for my “failures” for both have helped shape me. The “failures” have always been turning points and a redirection of my life. I wouldn’t be where I am now without them. Thank you for listening. There’s more but that’s enough for now. 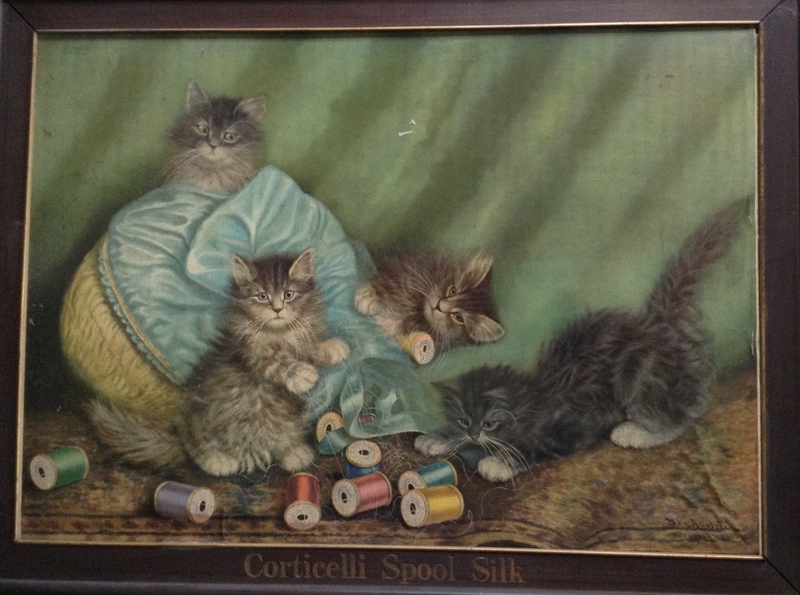 The image is an old advertising sign for Corticelli Spool Silk. They are our official office cats. P.S. The Corticelli cats are my office cats, not Katherine’s.